It seems all of my go-to meals have something in common – they’re made in a single skillet. Okay, some require a pot of rice on the side. But, the really simple ones – the ones I find myself whipping up on a Friday night after a long week – are the ones that don’t even require that. Skillet suppers. One pot meals. Simple suppers. They’re not fancy. But, done well, they become the meals your family craves – the comfort foods the ask for over and over. One Pot. One Bowl. One Happy Tummy. In a large skillet over a medium flame, heat the oil and sauté the onion until translucent. 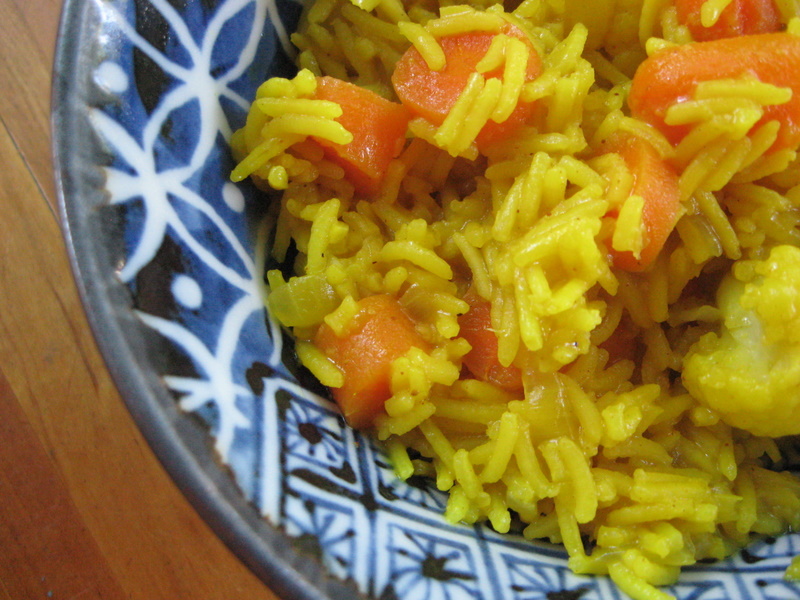 Add the curry, rice and carrots and cook for about 1 minute. Add the garlic and ginger and cook for another minute. Add the liquid, cauliflower and salt. Stir well. Cover the pan and turn down the heat. Simmer until liquid is absorbed and veggies are tender. You may need to add additional liquid. Serve with a dollop of thick coconut milk on top. This entry was posted in carrots, cauliflower, Indian, vegan. Bookmark the permalink.